I have several Fenton Eggs and I love the designs on each and every one of them. I have been staring at this particular egg and trying to get my nerve up to use it as inspiration for nail art. Tonight I finally decided to try it. Not quite what I was going for but I kind of like it. I used a base color of Misa Persian Carpet. This is a gorgeous shimmery polish. But it does require several coats to reach an opaque state. Then I used acrylic paints and tried to used the one stroke paint method to paint the flowers. This is a technique that I am trying hard to master. The tutorial videos I have watched make it look extremely easy. Let me just say - it isn't as easy as it looks. I used some green acrylic paint to add leaves. I finished the flowers off with a gold striping polish. Then came the hummingbird. . . Green acrylic paint and a small brush. 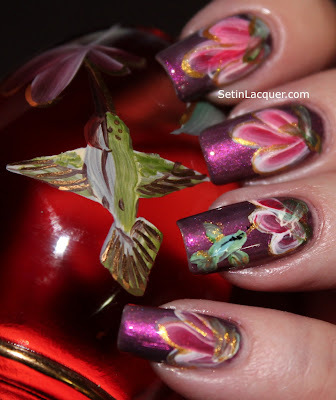 I used the gold striper for the bird's wings, beak and tail. Then I added some shadows with a gray acrylic paint and more detail with a black striping polish. I finished it off with a coat of Seche Vite Fast Dry top coat. What are your secrets for the one stroke painting method? I love the look of the one-stroke nail art. It looks so simple yet requires a certain amount of finesse. I am bound and determined to master this technique. 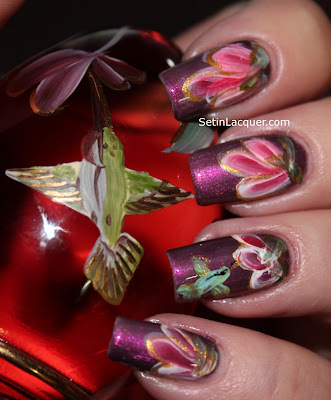 One stroke nail art is completed by using acrylic paints. Use two colors on a flat brush - half the brush with one color and the other half with the other color. Then using a practiced motion it should create a flower (or whatever else you are trying to make.) that has a gradient effect. Notice I said it "should create." I am practicing and thought I would share my attempts at one-stroke nail art with you. This is the one I am most pleased with. I used Orly Mysterious Curse as the base. Then I loaded my brush with blue and white acrylic paint and made the flowers. I used a dotting tool to add some dots of white on and around the flowers. 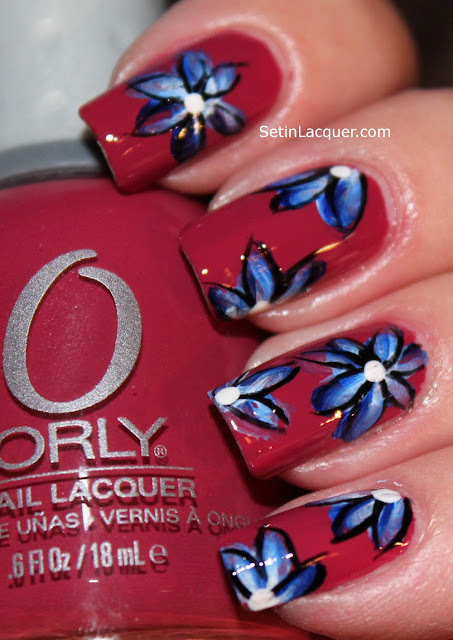 I also used a black striping brush to add some definition to the petals. On this one I used a base color of Orly Terra Mauve. I made the flower petals a little more pointed and used a striping brush to outline the petals. I definitely need a lot more practice. But I think I am making progress. Have you tried one-stroke nail art? What are your tips? I watched a video on YouTube from CutePolish (actually I have watched a lot of her videos as she does amazing work.) and just had to try it out. The philosophy was simple. It looked simple. It looked amazing. And it didn't look like that on me. The idea was to put the temporary tattoos on your nails. I tried. I pressed hard with a water-soaked paper towel. I tried with a water-soaked cotton ball. I am not sure where I went wrong. I tried it on a wheel and it came out amazing. All I can think is that I shouldn't have applied a top coat before I tried to apply the tattoo. One stroke experiment - And that is supposed to be a flower. The idea I had was positively stunning. In my mind's eye anyway. I painted my nails with Orly Snowcone except for the ring fingers, which I painted with Zoya Creamy. Up to that point I was successful. Then I was going to try and apply the glittery Sun on one ring finger and the moon on the other ring finger. This is where it went wrong fast. The tattoos just would not stick. So then I reapplied Creamy to the ring finger again and tried with a butterfly tattoo. My nails were not having any part of those tattoos. I wasn't about to let my color scheme go to waste so I pulled out my acrylic paints. Now when I bought these acrylic paints I had visions of grandeur. I quickly realized that when I tried the "one stroke" method it looked like a finger painting from a kindergarten class. I came to grips with the fact that I am not an artist. Even when I practiced I would think I was getting it... until I tried painting on my right hand. So the paints went into the closet with the rest of my brilliant ideas. But tonight I was determined to do something beside stamping or scotch tape art. And I was rapidly losing patience. So trying another Fenton Egg inspired manicure was out of the question. With little patience and even less artistic ability I dove right in before I lost my nerve. The end result is something I like but is definitely abstract. Have you tried the tattoos? What are your tips for success? How about the one stroke painting method?